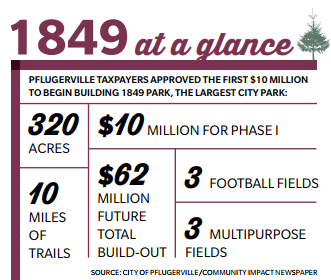 ​​​ PFLUGERVILLE – Soon to become the focal point of recreation opportunities in Pflugerville, the 1849 Park is full speed ahead with construction on the north side of Cameron Rd. two miles east of SH 130 and East Pecan St. The first phase, funded by a 2014 parks and recreation bond, is under construction, with turf placed on football and multipurpose fields. Subsequent phases will be discussed and developed as the project moves forward. ​Check​ out more public facilities stories across Texas.